Sony Xperia E is an 3.5 inches touch tablet smartphone powered by Android Jelly Bean v4.1 OS. It has two difference series name (depend on region and carrier) for Xperia E C1505 and Xperia E C1504. The first series for dual-band HSDPA 3G 900/2100 Mhz frequency and the last for HSDPA three band 850/ 1900 / 2100 Mhz. This phone seems to be the middle class phone. This can be decided from the specs come along with Sony Xperia E. CPU uses 1Ghz speed Cortex A5 with 512MB RAM, and for GPU uses Adreno 200 and Chipset uses Qualcomm MSM7227A Snapdragon. The phone only has 2GB user memory available from the total of 4GB but there is a microSD external memory slot. 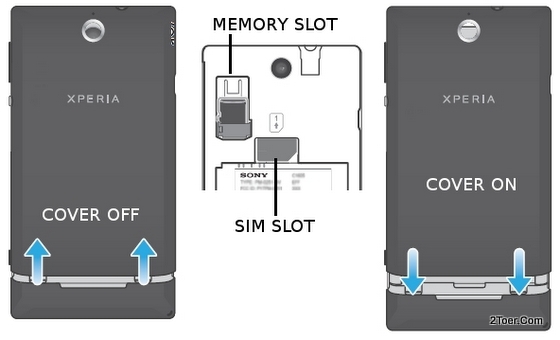 You need to insert your provider SIM card on Sony Xperia E, or wanna install the additional external memory card? First of all, you need to open the back cover case before you able to do that. Hold the Xperia E body with your both hand, make sure the rear cover is facing up, then place both of your thumbs a bit lower position of the rear casing, the press the cover and slide the cover upward. Repeat the step until the back cover is slide off from the phone's body and removed. Attaching the cover back: Slide the cover from top to bottom (downwards), then press the cover down until it's locked. 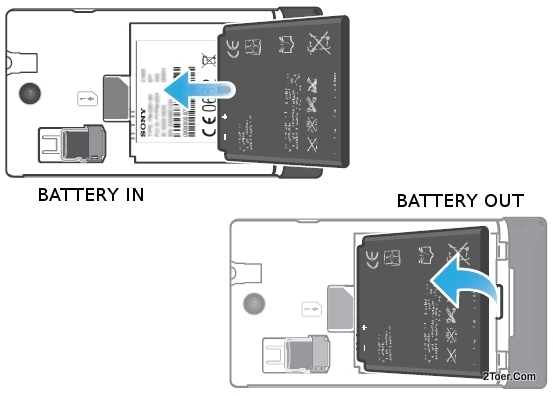 You don't need to remove the battery if you just wanna insert the microSD card to its slot, but in case you have to install the SIM card, you have to make sure that the battery haven't been assembled. It's because the SIM slot locates on the top-side wall of the battery compartment. For the memory slot, it locates on the left side of 3 Megapixel rear camera. Align the microSD with gold-contacts facing downwards to its slot, then slide/push it into the slot until the memory lock to its slot (there is a plastic clip that holds the memory card). To remove, push down the clip-holder with your forefinger, then using your other hand, slide the microSD memory card out from the slot (make sure the clip is passed by) then you can fully take the card out. Done. But please make sure the card is already safe to be removed: Got to Settings > Storage > Unmount SD card, first! 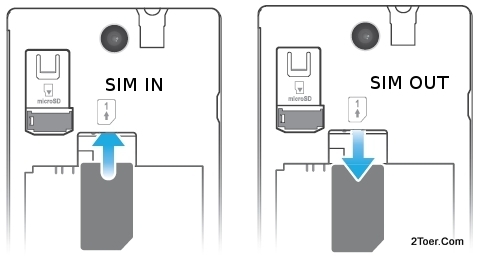 Using your standard SIM card type of your favorite provider, insert the SIM card to the slot with gold-contact is facing down, and the cut-edge on "outside" position. If you face a problem on inserting the SIM, try to push it with your fingernail from cut-edge side. 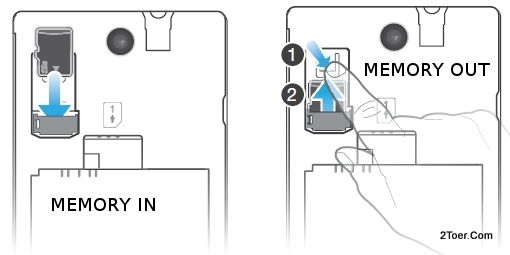 And to Remove the SIM card, just use your fingertip to press the "seen" part of the card to make a little grip in the card, then slide the card out from its slot. Done. Align the Li-ion 1530 mAh battery with metal-contacts with compartment connector, make sure the labels is facing up, then slide and press down the battery until it perfectly fit into the compartment. To remove the battery from its compartment, user the gap/cave locates on the bottom comparment side as a starting point, use your fingernail or fingertip, press and lift the battery up. Remember to do Factory or Hard Reset with adequate reason. If you just need to restart or reboot your phone because your Sony Xperia E C1505/ C1504 suddenly hang or stop responding, you only need to open the cover, detach the battery, wait for a seconds, then assemble the battery, and turn back your phone on.